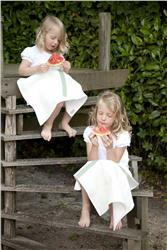 As part of our Carolina Cross theme, the Giorgia collection also offers napkins, placemats and a runner. It is the same fabric as the Kalahari towel and table linen, just a different color stripe pattern. towel = 23.5" x 31"